Let the chants be heard and the jigs be seen! It’s almost St. Paddy’s Day and you better believe Whistler has you covered. 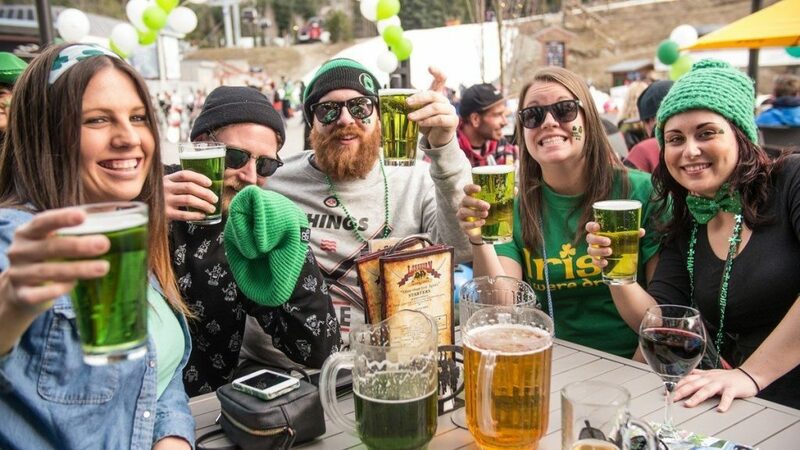 Find out what you need to know and where you need to be to have the best Whistler St. Patrick’s Day. St. Patrick’s Day is a cultural and religious celebration in Ireland to commemorate Saint Patrick, and it is also known as the Feast of Patrick. As the day falls during the period of Lent, a Christian season of fasting and preparation for Easter, restrictions on eating and drinking are specially lifted, granting all a pass to party and indulge. So given the privilege to celebrate during this time, it would be rude not to party too, right? Dig through your suitcase or closet for something green to wear. Hint; not visibly wearing something green can result in getting yourself pinched. Wear green socks under your pants – pinched. Knee high green socks over your pants – good to go! We recommend a green shirt and hat to avoid as many pinching opportunities as possible. But don’t stop there, swing by the Gibbons Hub in the Westin Whistler in the village to pick up some fun shirts to make your St. Patricks Day outfit complete. Sausage, bacon, fried eggs, beans and potatoes are breakfast staples in Ireland, so go to breakfast hungry! Don’t skip the chance to try the Black Pudding at the Dubh Linn Gate, an Irish specialty. If you can’t stomach a big hearty breakfast, Lucky Charms is an acceptable alternative. When it comes to dinner order a Shepherd’s Pie, Irish Stew or at least something with potatoes or cabbage in it to keep with the traditional Irish food theme. Guinness: The iconic smooth, dark beer. Irish Whiskey: Uisce Beatha is the Gaelic term for whiskey and translates to “water of life”. Irish Whiskey brands include Black Bush, Bushmills, Jameson, Paddy, Powers, and Tullamore Dew. Ciders: Magners Irish Cider, also branded as Bulmers Cider. Poitin: Made from barley or potatoes, it’s the Irish equivalent of Moonshine. Banned in 1661 because of its high potency, you can find still something comparable if you dare. Bunratty Irish Potcheen is a third of the original Poitin’s strength, but is more than enough to knock you off your feet! Green Beer: While it is more of a North American Irish tradition, it’s definitely a fun one! Make your way to Tapley’s Neighbourhood Pub to experience Green Beer this St. Patrick’s Day. Craic: Fun, enjoyment, general banter and good times had by all. Also, a person who is good fun or great company. The Fear/The Beer Blues or Drinkers Remorse: hung over. Wrecked: Very tired, most likely how you’ll feel after St. Patrick’s Day. Sláinte: The Irish version of Cheers! We’re definitely not encouraging you to tell these pretty cheesy Irish jokes, after a couple of beverages you might just want to. What type of bow cannot be tied? A rainbow! Whistler’s Dubh Linn Gate is the only Irish Pub in town with a year-round, authentically Irish menu, so make sure you have a meal or two here! The Doolins, Chris Witoski, and Chronicles of False Creek will all be performing throughout the day. Longhorn Saloon is hosting a Paddy’s Day Patio Party with a mix of live DJ’s that is guaranteed to get you dancing on the tables. Want to keep the party going? Head over to Buffalo Bills or Garfinkel’s, to see Brooks, with support by Good Lyfe & special guest. 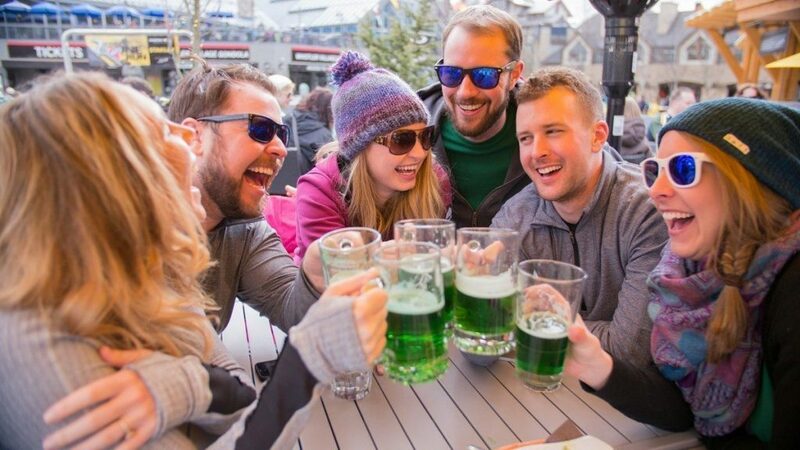 Are you heading up the Sea-to-Sky for a Whistler St. Patrick’s Day to remember? Let our expert Whistler concierge services help you plan the ultimate day, night or even weekend of celebrations. With all the insider tips on Whistler, our team can plan your next unforgettable experience.